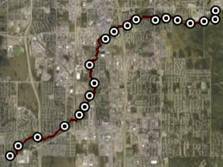 Salmon help keep the Campbell Creek Watershed and our economy healthy and alive! 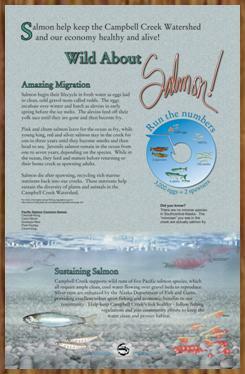 Salmon begin their lifecycle in fresh water as eggs laid in clean, cold gravel nests called redds. The eggs incubate over winter and hatch as alevins in early spring before the ice melts. The alevins feed off their yolk sacs until they are gone and then become fry. Pink and chum salmon leave for the ocean as fry, while young king, red and silver salmon stay in the creek for one to three years until they become smolts and then head to sea. Juvenile salmon remain in the ocean from one to seven years, depending on the species. While in the ocean, they feed and mature before returning to their home creek as spawning adults. Salmon die after spawning, recycling rich marine nutrients back into our creeks. These nutrients help sustain the diversity of plants and animals in the Campbell Creek Watershed. Did you know? There are no minnow species in Southcentral Alaska. The "minnows" you see in the creek are actually salmon fry. Campbell Creek supports wild runs of five Pacific salmon species, which all require ample clean, cool water flowing over gravel beds to reproduce. Silver runs are enhanced by the Alaska Department of Fish and Game, providing excellent urban sport fishing and economic benefits to our community. Help keep Campbell Creek's fish healthy - follow fishing regulations and join community efforts to keep the water clean and protect habitat. For more information about fishing regulations go to: www.sf.adfg.state.ak.us/statewide/regulations/scregs.cfm.